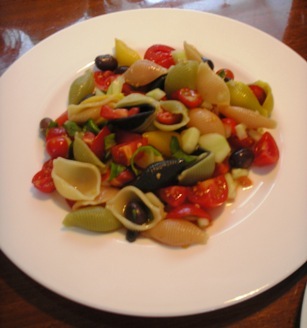 This dish will become one of your favorite pasta boat recipes! It's light, nutritious and it's a pleasure for the eye. And it makes a perfect lunch! This recipe is good for 4 people and takes about 40 minutes. First, you take a big pot of water and you add a handful of salt. (On my transatlantics I just used seawater...) Put the pot on the fire until the water boils. 2. Now you throw in the pasta and the cloves of garlic and you let it cook. The duration depends on whether you're using fresh pasta or out of a bag/box. Check from time to time if the pasta is al dente, which means that it's not hard anymore, but that you still got some bite...If the pasta falls apart, you went way too far! 3. When the pasta is al dente, stop the fire and let the pasta drain. Then put the pasta in a bowl. Take the cloves of garlic out and put them apart. 4. 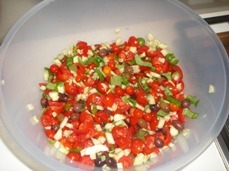 Next, you have to chop your cherry tomatoes, cucumber, basil leaves, chives and olives. 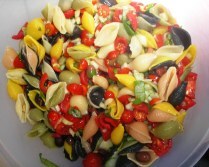 Chop them as small as the half size of 1 shell-shaped pasta. Put it all in the pasta bowl! 5. Now, you take the skin off of the garlic cloves and you put them in your pestle and mortar. Add a pinch of salt. Pound the lot! After that, you put it in a small plastic cup and you add the vinegar, olive oil and some salt and pepper. 6. 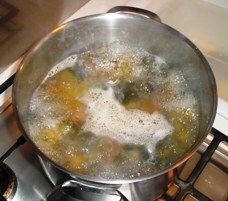 And finally, you pour step 5 in your pasta bowl and stir it around. You have made one of the best pasta boat recipes! Go to our Galley Shop! And What's Your Favorite Boat Recipe? Click here and share it with us!